When you begin to learn Mandarin Chinese, one of the first things you might pick up on are the certain repetitive graphical components within different characters. Perhaps a certain piece of a character might resemble a tree, and you see it in 树，林， and the classic Chinese idiom 一木难支. Or these three water drops that attach themselves to all characters that are water-related, such as 江，河，and 湖. Do these look familiar? 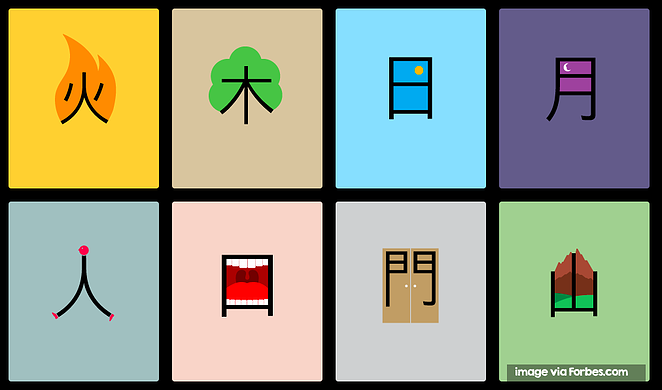 These repeated graphical components are called radicals, which are as essential to Chinese as the alphabet is to English. In fact, radicals are the way by which characters are traditionally listed in a Chinese dictionary! Radicals are the crucial building blocks of Mandarin Chinese characters, and a solid understanding of radicals allows you to accelerate your learning, understanding, and writing of Mandarin Chinese. There are over 200 radicals in the Chinese language. But before you get intimidated by that number, here is the good news. Mandarin Chinese radicals largely fall into a few categories, and closely resemble what they represent. Once you have a foundational grasp on these categories of radicals, you will be able to get a good sense of what a Chinese character means, even if you have never encountered it before. Neat, right? Here, we have consolidated a quick-and-easy guide to Mandarin Chinese Radicals, as grouped by their theme. All of these radicals are frequently used (meaning that you won’t waste your time studying something super-obscure), and will serve as an incredibly helpful resource for people who are in the beginner and intermediate stages of learning Mandarin Chinese. While this is by no means an exhaustive list of Chinese radicals, it is a great way for Chinese learners to differentiate between look-alike Chinese characters, make educated guesses on the meaning of unfamiliar characters, and quickly get comfortable with reading and writing Chinese. Chinese might give off the perception of being an especially difficult language to learn, but when we can approach learning Chinese in a smart way, it won’t be long until you can enjoy mastering the Mandarin language.